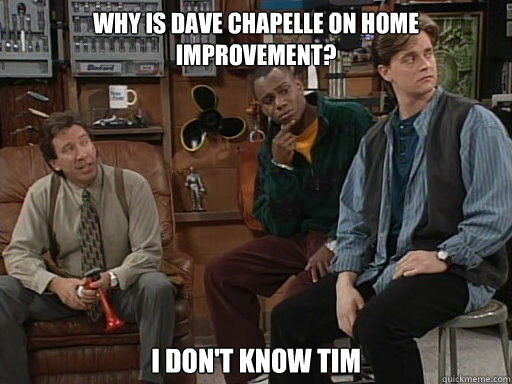 In 1995 Dave Chappelle and Jim Breuer made an appearance on Home Improvement playing characters by the names of…wait for it…Dave and Jim. I’ve kind of glossed over the story of how all of this came to be and what it would nearly become but luckily for you the great people at Splitsider have come to the rescue and have written a great piece on this complete with research and everything! I highly suggest giving it a look as it is always fun to look back on these things and wonder “what if”. Check out the article here. I’m hoping to ssee the same high-grade content by you in the future as well. I was curious if you ever considered changing the page layout of youur blog?